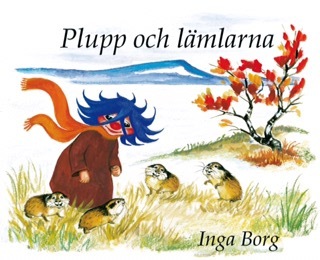 Plupp is the protagonist of a series of children’s books by Swedish author Inga Borg, who first created the character in 1955. Plupp can speak to all animals and we can learn alot from plupp’s love of naturen. Plupp is a small figure with blue hair and a red nose, who lives in a kåta by a lake called Blåvattnet (“Blue Waters”) somewhere in the far north. Borg describes the character as an invisibling (meaning that Plupp is invisible to humans) who is both human and animal in nature. She further explains that Plupp is neither male nor female, as she wanted to create a character that children of both sexes could identify with. Plupp also has the ability to talk with animals; two of his closest friends are the lemming Lämmel and the stoat Hermelin. The books about Plupp have been translated into Danish, Inari Sami, Northern Sami, Skolt Sami, English, Esperanto, Finnish, French, Faroese, Greenlandic, Icelandic, Norwegian, and German. In 1968, Borg adapted the books into the animated TV series Plupp och hans vänner (“Plupp and his friends”). In 1970, Borg received the Elsa Beskow Award for the Plupp books.